Hey, Salesforce administrators! Just in time for Dreamforce and the Winter ’15 release, we have a new incarnation of the Salesforce1 Mobile App Admin Guide, designed for you, our point-and-click heroes! So, what’s new about it? The biggest change is in its content. First, we’ve revised its scope. The previous Salesforce1 App Admin Guide focused on working with sample data in a Developer Edition organization, walking you through a set of exercises in workbook style. The new, enhanced guide steps away from the workbook format. * It addresses Salesforce1 in the context of your own organization, helping you to get it optimized, configured, and customized so that your users’ mobile experience with Salesforce1 is the best it can be. Second, it’s been expanded to cover more. In addition to updated information about Salesforce1 navigation, compact layouts, page layouts, and actions, we’ve also added new chapters, including ones about the new Salesforce1 Wizard, getting Visualforce pages into Salesforce1, and custom branding of the Salesforce1 mobile app. 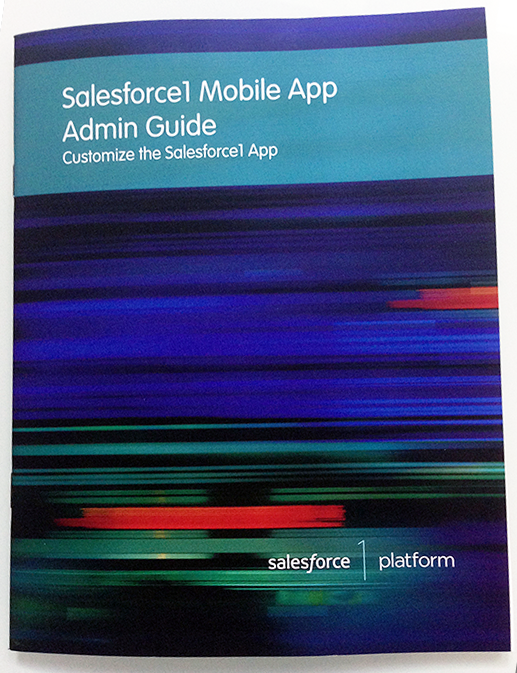 If you’re joining us for Dreamforce ’14 this week, you can pick up a printed copy of the new Salesforce1 Mobile App Admin Guide at the Developer Library in the Dev Zone on the 2nd floor of Moscone West. You can also get it from the Salesforce Developers web site in both HTML and PDF formats. * Don’t worry, those workbook-style exercises haven’t gone away! All that content is still available in the “Salesforce1 Administration” section of the Salesforce1 App Developer Guide.